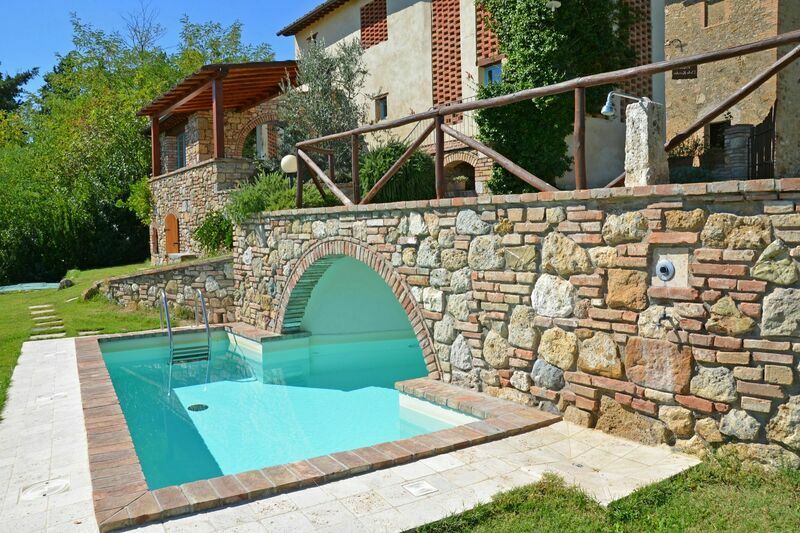 Charming restored barn situated in quiet and panoramic location on the hills surrounding the beautiful medieval town of San Gimignano. This property is private and offers a nice outside area enjoying extensive panoramic views over the surrounding landscape. The barn has been recently restored preserving its original architectural features and nicely furnished in a typical Tuscan style. The location is ideal to spend a relaxing holiday in close contact with nature and at the same time to visit the most beautiful corners of Tuscany. Distances: the charming town of San Gimignano with all kinds of shops 3 km away, Poggibonsi and Certaldo with railway station 10 km away, Siena approx. 40 km, Florence (airport) 50 km away. At guests’ disposal: furnished garden offering nice panoramic views, barbecue, private beautiful swimming-pool partially covered - irregular shape (open from 01/05 to 30/09, maximum depth 1,6 m). Washing-machine and ironing facilities available. Extra Services: Baby bed available on request (€ 30,- / per week to be paid on the spot). Maid service available by arrangement at € 10,- / per hour (payment on site). Ground floor: living-room (satellite TV) with dining area and access to a furnished terrace. 4 steps higher: kitchen (oven, freezer, dishwasher, microwaves, toaster, orange squeezer, American coffee maker), toilet, double bedroom with access on to the outside. 1st floor: double bedroom, bathroom with shower, bedroom with a single bed and access on to the outside.